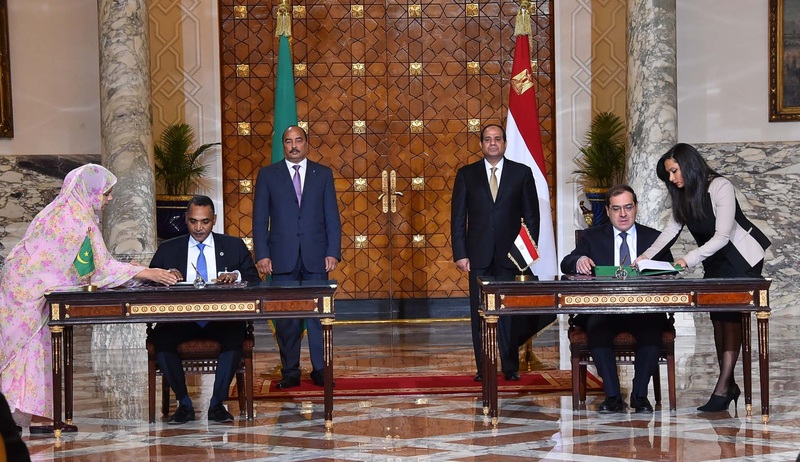 Egypt and Mauritania signed six memoranda of understanding with Mauritania on Sunday in the presence of the two countries’ presidents, Abdel Fattah Al-Sisi and Mohamed Abdel Aziz, according to a statement from Egypt’s State Information Services. The signed memoranda will see the two countries cooperate in the fields of maritime transport, building and housing developments, culture, petroleum and minerals, and the health sector, among others. Prior to the signing ceremony, Al-Sisi and Abdel Aziz met at the presidential palace to discuss a number of issues of mutual interest and methods to improve bilateral relations between the two African countries. Al-Sisi also presented Abdel Aziz with the “Order of the Nile” medal, which is considered Egypt’s highest state honor for providing the country with “exceptional services,” state-owned Ahram Online reported. Abdel Aziz arrived in the Egyptian capital on Saturday. He previously visited Egypt to attend the inauguration ceremony of the “New Suez Canal,” one of several mega-projects launched under Sisi’s auspices. Since his ascension to the presidency in 2014, Al-Sisi has been looking to diversify Egypt’s traditional economic and diplomatic relations. During his tenure, the country has rekindled bilateral relations with China, Japan and a number of other countries.